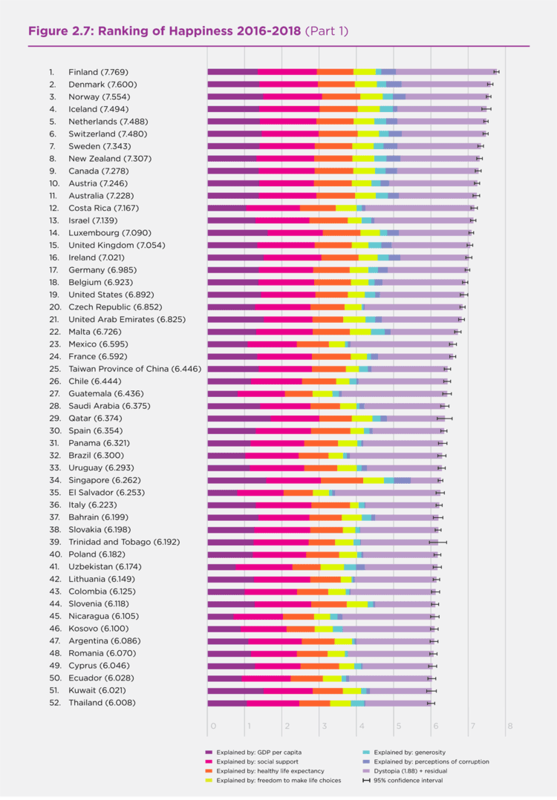 UN World Happiness Report yesterday released and revealed Finland as the happiest country in the world for the second year in succession. Finland topped the list of 156 countries, which were ranked in the United Nations Sustainable Development Solutions Network's 2019 World Happiness Report. The report ranks countries on six key variables that support well-being: income, freedom, trust, healthy life expectancy, social support, and generosity. Rounding out the top 10 were Denmark, Norway, Iceland, Netherlands, Switzerland, Sweden, New Zealand, Canada, and Austria. According to the report, the overall world happiness has fallen over the past few years, which has mostly been fueled by a sustained drop in India, which came in 140th place this year compared with the 133rd place in 2018. Australia is ranked 11th, UK 15th, Germany 17th, USA 19th, UAE 21st, Mexico 23rd, France 24th, Spain 30th, Singapore 34th, Thailand 52nd, Russia 68th, Turkey 79th, Greece 82nd, China 93rd, Cambodia 109th, and Ukraine is placed at 133rd, according to the report.